Special thanks to Seeds of Change® for sponsoring today’s post and inspiring this recipe! 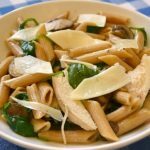 This One Pot Creamy Chicken Mushroom Pasta is all of my favorite things in one – easy, quick, delicious, and full of nutrients. If you feel like you have to trade healthy for convenience, you’ll love this dinner recipe that delivers both! The secret to getting gourmet flavor in under 30 minutes without giving up your standards for wholesome ingredients is to use a Seeds of Change® Organic Sauce. 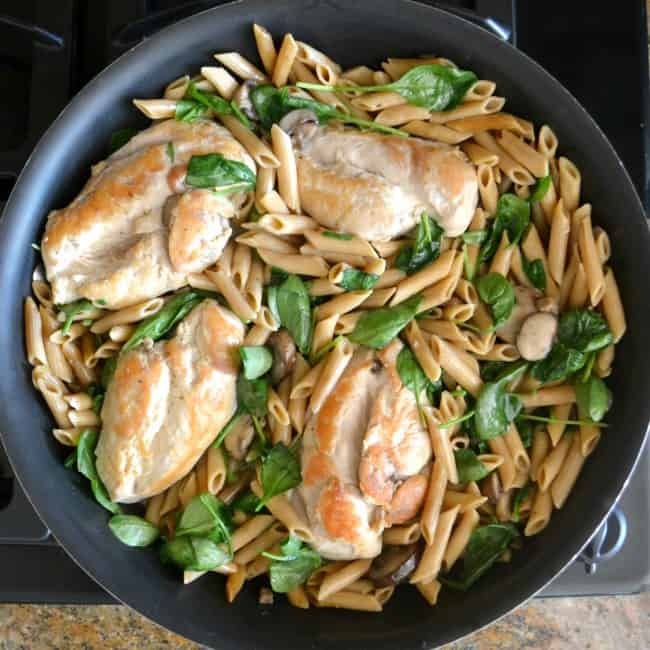 I use the Mushroom Simmer Sauce in this recipe. 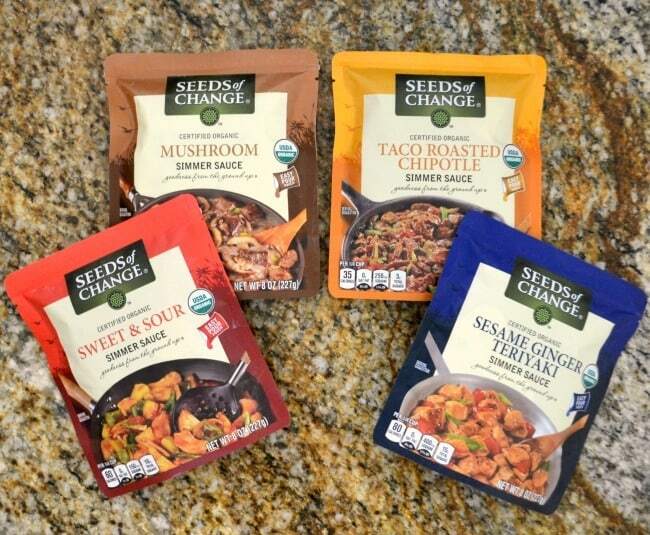 Why Seeds of Change® sauces? Because they are certified organic and contain NO artificial colors, flavors or preservatives. You’ll recognize every ingredient in each of the sauces and they taste amazing! Since I’m all about saving time where I can so I can spend it how I want, I try to limit the number of dishes I dirty as I prep dinner. 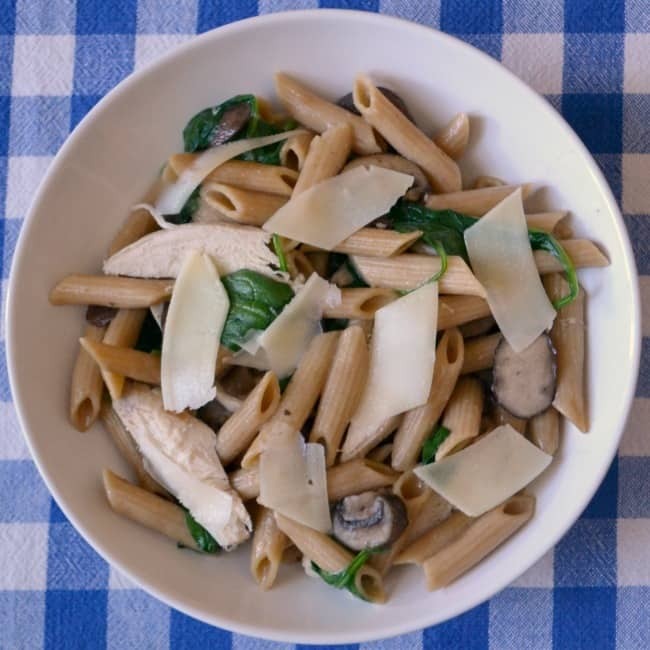 This creamy chicken mushroom pasta is no different. All you need is a large skillet and a wooden spoon. 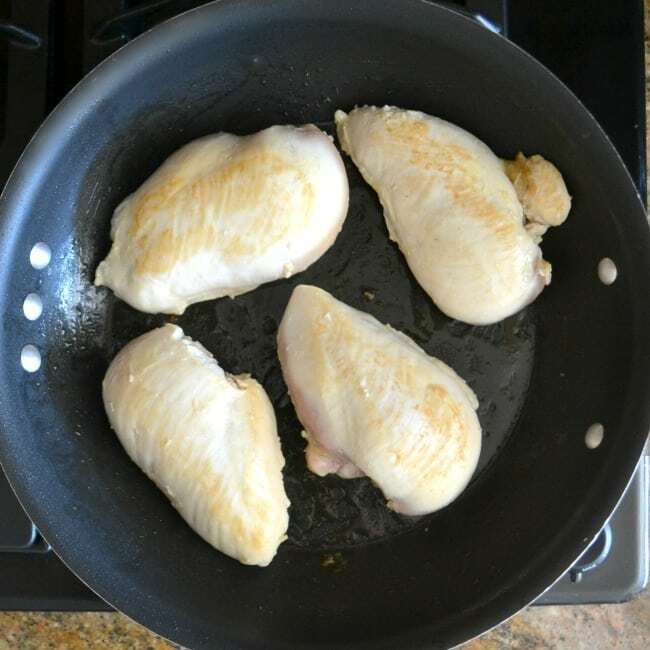 Heat some olive oil in your skillet and then brown the chicken on both sides. 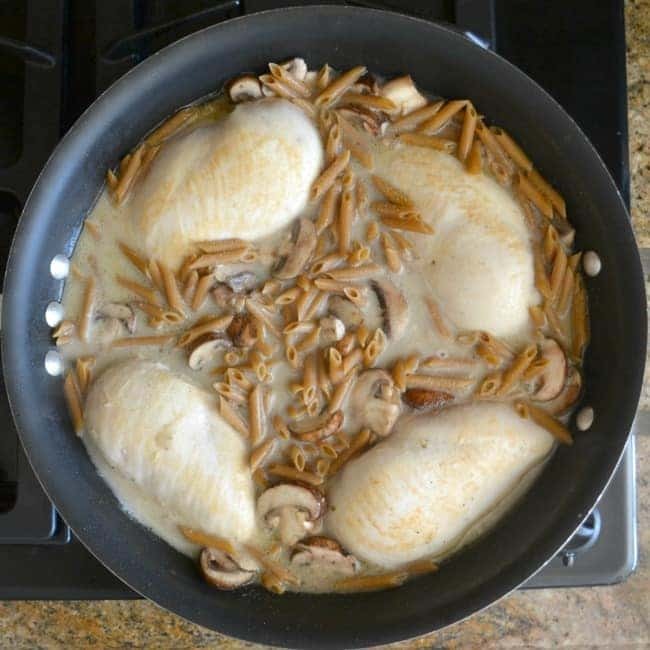 Next, add the sliced mushrooms to the skillet and sauté them for 2-3 minutes. Finally, you’ll add the remaining ingredients to the skillet. 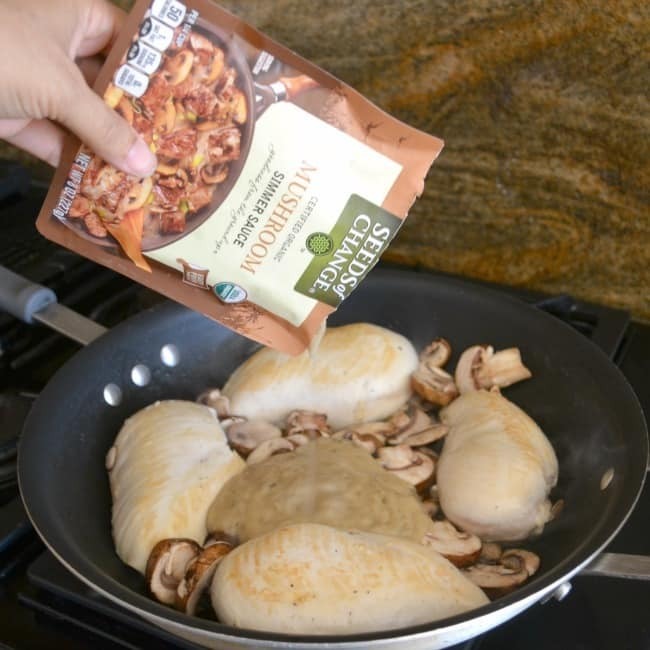 Pour in the Seeds of Change® Mushroom Simmer Sauce. Then the chicken broth, milk, whole wheat pasta and seasoning. Reduce the heat, cover, and simmer for 15-20 minutes. Remove the skillet from the heat and stir in the fresh spinach. Spoon portions onto individual plates. Then, top with shaved parmesan (you can use grated parmesan instead, but I think the shaved cheese looks prettier). Here’s a printable version of the recipe with all the details. In a large skillet over medium high heat, heat olive oil. Add chicken and brown on both sides (about 2-3 minutes per side). 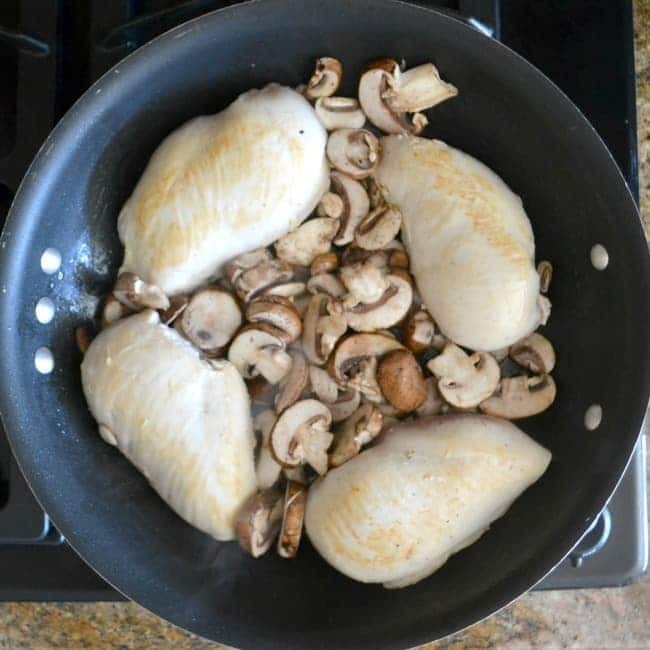 Add butter and mushrooms to skillet and cook for 3-4 minutes. Add sauce, broth, milk, garlic powder, salt and pepper. Bring to a boil, then reduce heat to medium. Cover and cook for 15-20 minutes (until chicken is no longer pink in the middle). Remove from heat. Stir in spinach. Serve immediately. Garnish with shaved parmesan.